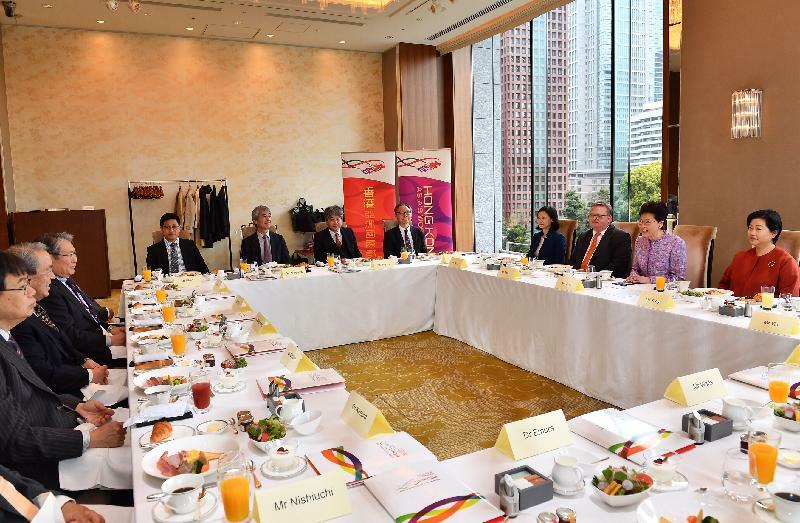 The Chief Executive, Mrs Carrie Lam, today (April 8) attended a lunch hosted by the Minister for Foreign Affairs of Japan in Tokyo. She also met with representatives of innovation and technology (I&T) enterprises, universities and academia and visited elderly care and medical facilities to learn more about the application and development of I&T in the relevant areas. 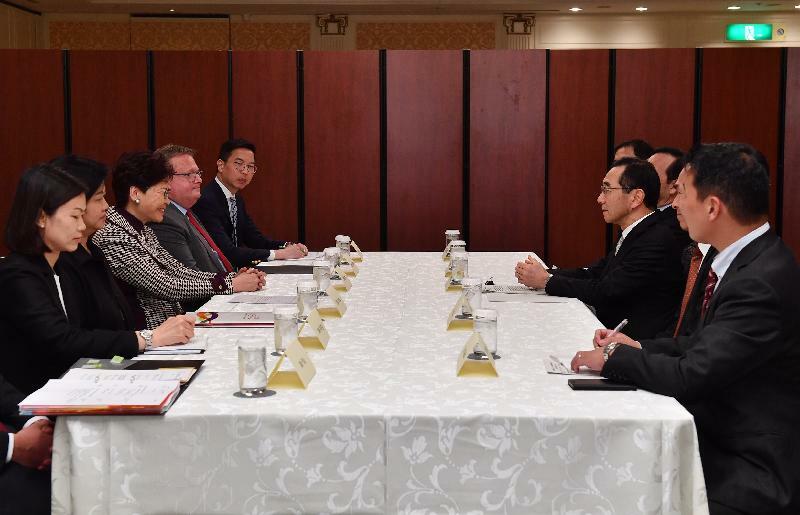 At noon, Mrs Lam had lunch with the Minister for Foreign Affairs of Japan, Mr Taro Kono. Thanking him for the arrangements made for her two visits to Japan within half a year, she said the five-day visit last year was fruitful, laying a sound foundation for further collaboration between the two sides. She said a joint statement issued after their meeting last time pointed out that Hong Kong would play an important role in the Guangdong-Hong Kong-Macao Greater Bay Area development and that Japanese enterprises are welcome to collaborate with Hong Kong to seize together the opportunities for development. She said the Central Government promulgated the Outline Development Plan for the Guangdong-Hong Kong-Macao Greater Bay Area in February, setting out the directions guiding the development of the Greater Bay Area. Fully and faithfully implementing the principle of 'One Country, Two Systems' under which 'the people of Hong Kong govern Hong Kong' with a high degree of autonomy is the guiding ideology for the development of the Guangdong-Hong Kong-Macao Greater Bay Area. She also said that the main objective of her visit this time is to attend the Symposium on the Guangdong-Hong Kong-Macao Greater Bay Area to be held by the governments of Guangdong, Hong Kong and Macao tomorrow (April 9), in which leaders of the three places will introduce the content of the Outline Development Plan and the development prospects. 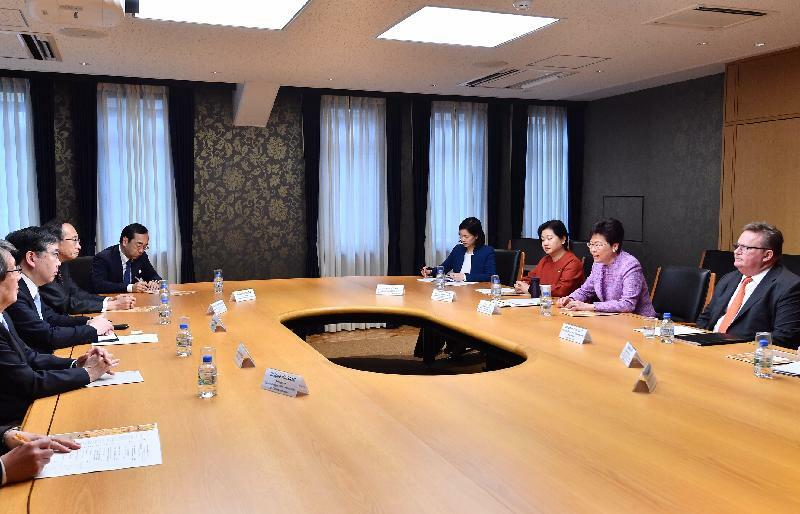 She expressed the hope that the interest of various sectors in Japan in participating in the development of the Greater Bay Area would be enhanced. She added that the Symposium is the first joint overseas promotion event by the three governments after the promulgation of the Outline Development Plan. On the issue of sanctions imposed by the United Nations (UN) Security Council against North Korea raised by Mr Kono, Mrs Lam reiterated that Hong Kong maintains a robust system of implementing UN Security Council sanctions in accordance with the law, and stays highly vigilant against suspected violations of UN sanctions. She added that the law enforcement agencies will continue to exercise their statutory authorities to follow up on all suspected cases seriously, without fear or favour. In the morning, Mrs Lam had a breakfast meeting with the Executive Director of the Japan Science and Technology Agency, Dr Yoshimasa Goto, and more than 10 others comprising members of the Agency as well as representatives of I&T enterprises and academia in Japan. 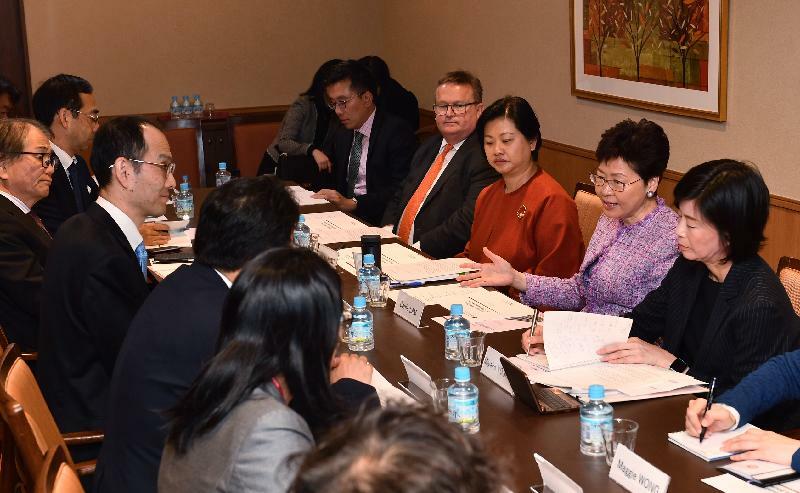 She briefed them on the latest I&T environment in Hong Kong and various initiatives and supportive measures rolled out by the Government to promote I&T development. 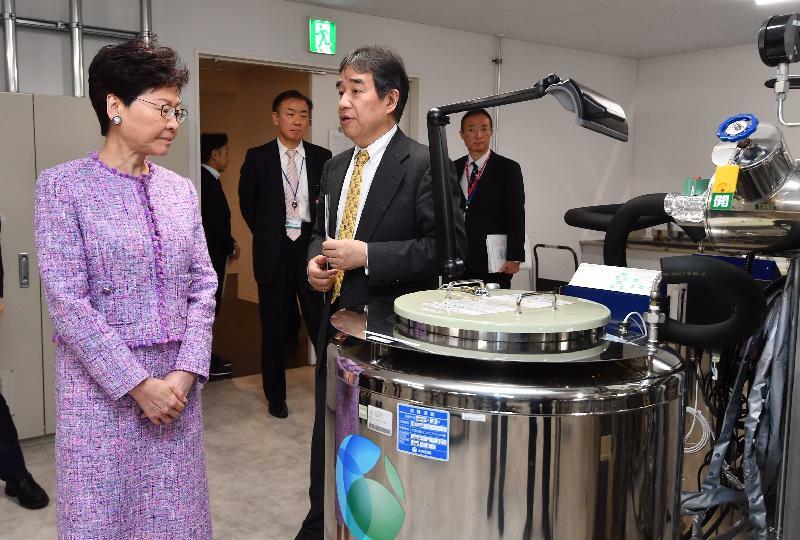 Pointing out that about $100 billion has been allocated by the current-term Government for I&T, including the establishment of two world-class research clusters specialising in healthcare technologies and artificial intelligence and robotics technologies at the Hong Kong Science Park, she encouraged Japanese enterprises and research institutions to actively consider setting up a presence in Hong Kong. 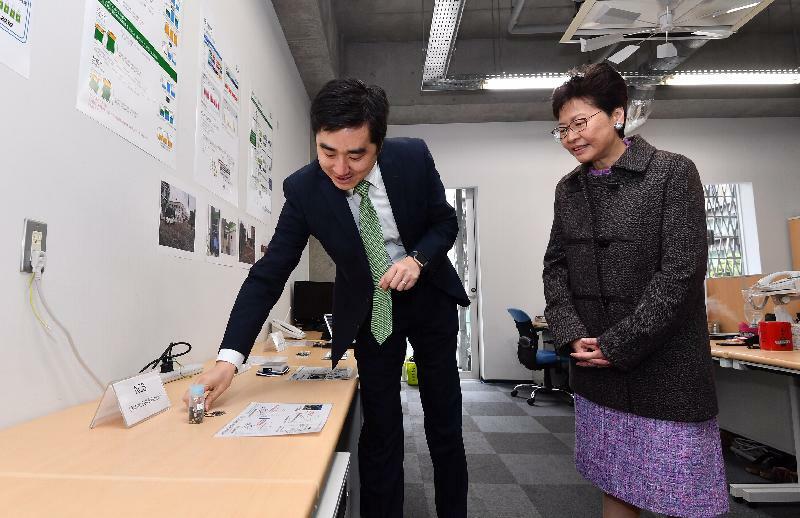 After the breakfast meeting, Mrs Lam met the President of the University of Tokyo (UTokyo), Dr Makoto Gonokami, and visited the school's start-up support facilities and learned about the collaboration between the university and industry. 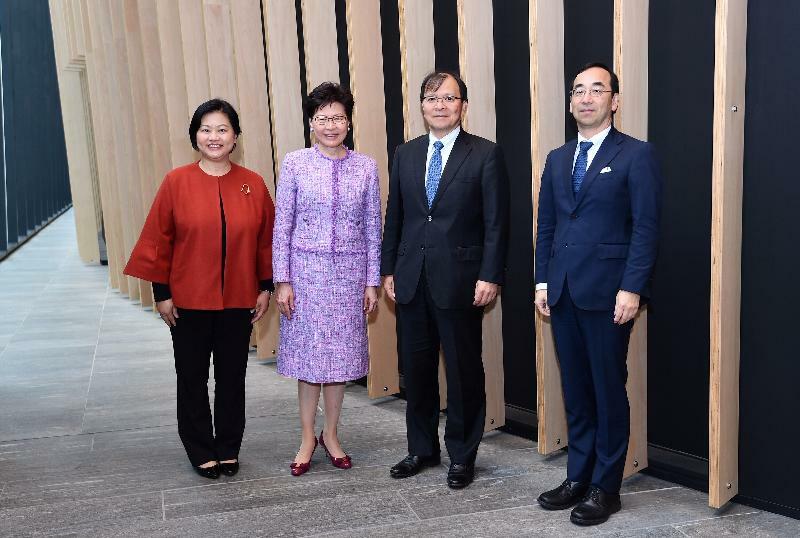 Given that UTokyo is a world-renowned university and has established connections with various Hong Kong universities in areas of student exchange and academic research, she encouraged the university to deepen collaboration, in particular on the I&T front. 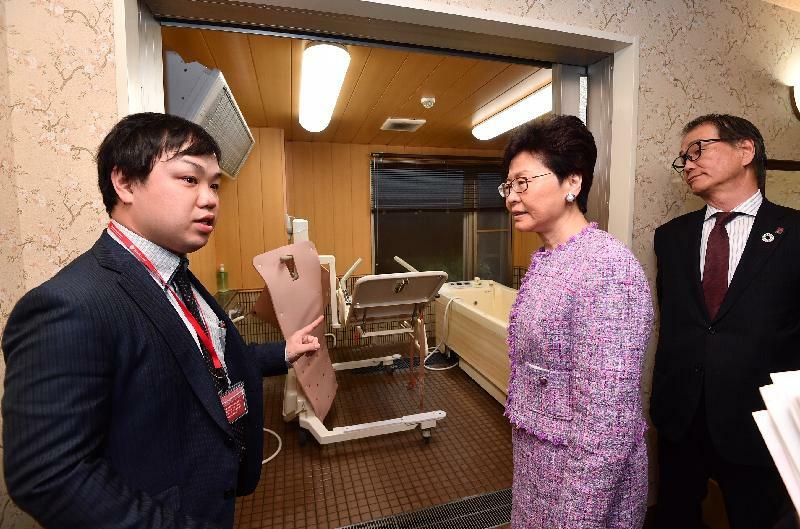 Mrs Lam then visited two nursing homes, one of which is funded by the Japanese Government and broadly uses gerontechnology in its services. She learned about the operation of intelligent equipment in the nursing home to improve the communication and mobility of the elderly. 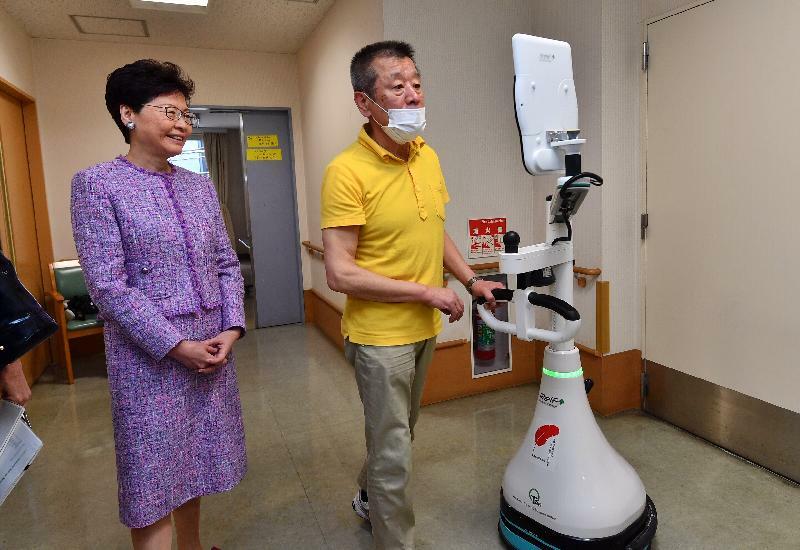 The other nursing home is operated by the second biggest operator in elderly care services in Japan, Sompo Care, which is a subsidiary company of an insurance group. 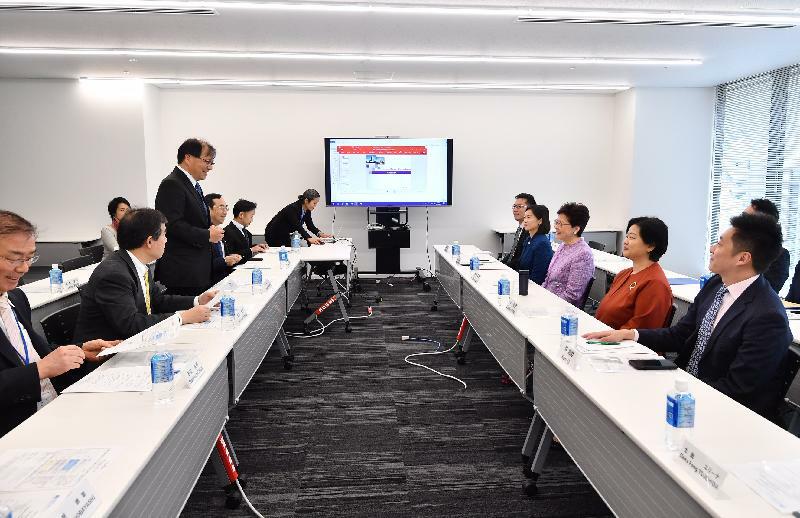 During the visit, Mrs Lam was briefed on the vision of the insurance group in running elderly care business, as well as the business model of and services provided by the nursing home. 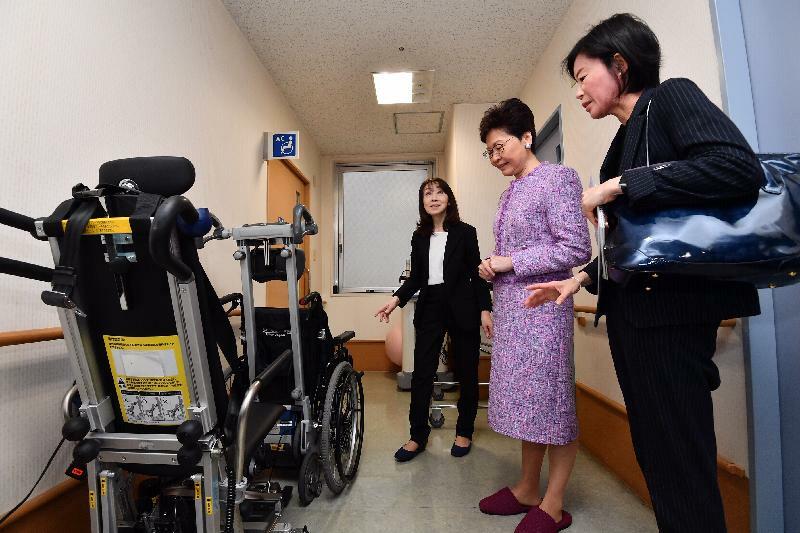 Stressing that both Hong Kong and Japan are facing the challenge of an ageing population, she said that there is much Hong Kong can learn from Japan's experience in the provision of elderly care services. 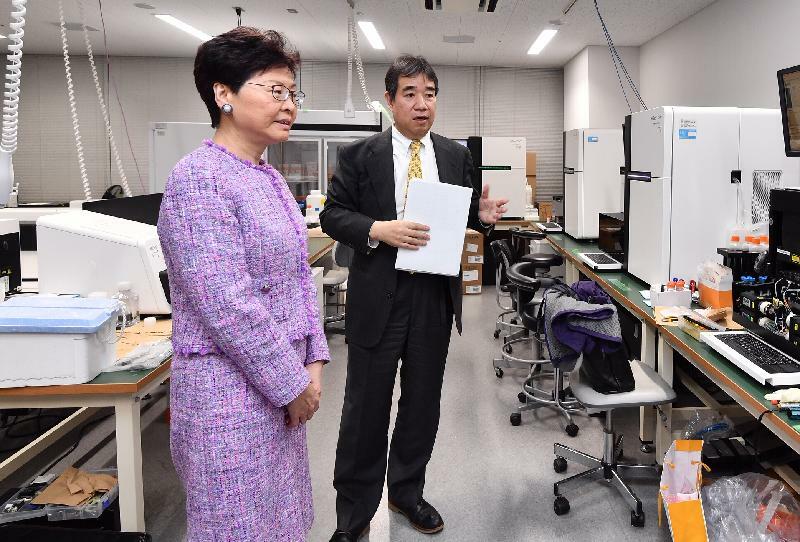 Mrs Lam also visited the National Cancer Center Japan (NCC), where she received a briefing on the operation of the centre and toured the Biobank and the genome analysis section. The NCC is committed to promoting genomic medicine for cancer treatment. Holding that genomic medicine is an important sphere in contemporary medicine and scientific research, the Hong Kong Special Administrative Region (HKSAR) Government at the end of 2017 established the Steering Committee on Genomic Medicine to lead the study on strategies for developing genomic medicine in Hong Kong. Mrs Lam expressed the hope that the NCC and the Steering Committee would enhance exchanges and collaboration in the future. 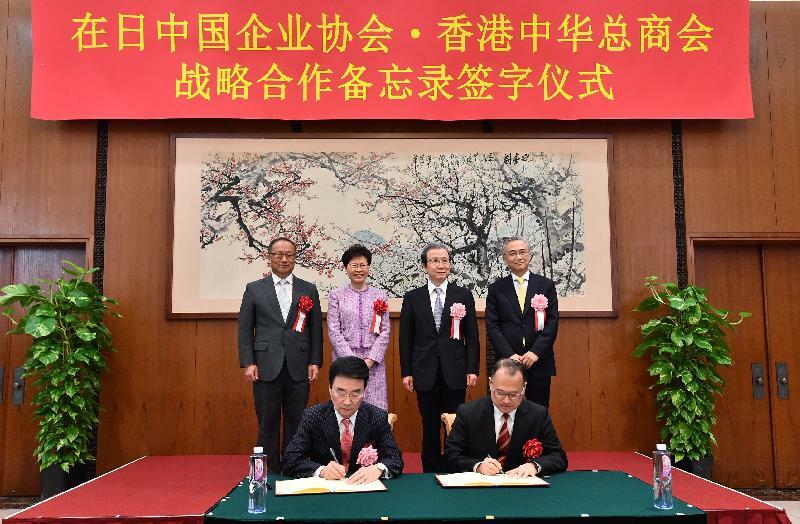 In the evening, Mrs Lam and the Chinese Ambassador to Japan, Mr Cheng Yonghua, witnessed together the signing of a Memorandum of Understanding between the Chinese General Chamber of Commerce of Hong Kong and the China Enterprises Association in Japan to enhance collaboration and exchanges. Mrs Lam then attended a dinner hosted by Mr Cheng and thanked the Chinese Embassy for its continuous support for the work of the Hong Kong Economic and Trade Office (Tokyo), and the assistance offered to Hong Kong people in Japan. After arriving in Tokyo yesterday afternoon (April 7), Mrs Lam met with the Chairman of the Japan External Trade Organization (JETRO), Mr Nobuhiko Sasaki. 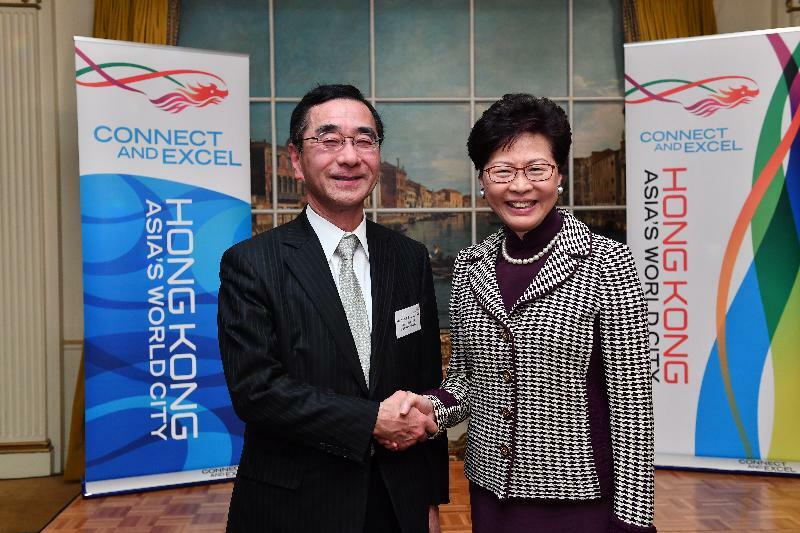 Mrs Lam congratulated Mr Sasaki on assuming the chairmanship this month and thanked him for accepting the invitation to be a guest speaker at the Symposium on the Guangdong-Hong Kong-Macao Greater Bay Area and for the long-standing support JETRO has given the HKSAR Government in its promotion work in Japan. 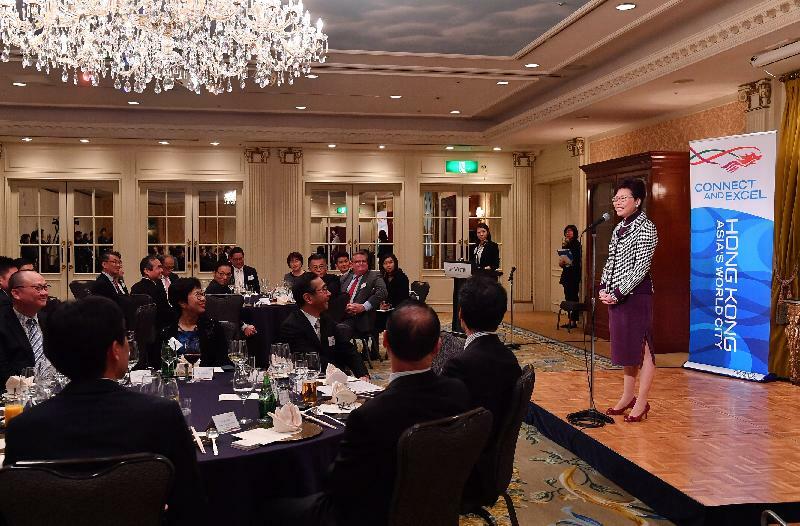 Mrs Lam then officiated at a dinner hosted by the HKSAR Government to show appreciation to speakers and supporting organisations of the Symposium on the Guangdong-Hong Kong-Macao Greater Bay Area. Some 30 guests including the Secretary for Administration and Justice of the Macao Special Administrative Region Government, Ms Sonia Chan, and the Deputy Director General of the Department of Commerce of Guangdong Province, Mr Chen Yuehua, attended the dinner. Mrs Lam will continue her visit to Japan tomorrow and return to Hong Kong in the evening.